A saddle valve offers a quick and easy way to add a small water supply line for a refrigerator ice-maker or water dispenser, a swamp-cooler, or a humidifier. The valve clamps onto the host pipe and has a needle-like shaft that is driven through the pipe wall to tap into the water flow. There are large versions of saddle valves for various applications, but the type you'll most like use around the house supplies a 1/4-inch water supply line and is designed to fit a 3/8-inch to 1-inch copper host pipe. Locate a section of the host pipe that is round (not dented) and has enough room around it to accommodate the saddle valve. The area should not have any solder or glue or be so close to another fitting that it hinders the saddle. Clean the section of pipe where you will install the saddle valve. Separate the brackets of the saddle valve and position the valve onto the pipe so that the upper bracket is on top of the pipe and the lower bracket is on the bottom of the pipe. The compression fitting—where you will attach the new water line—should be facing in the desired direction. Thread the two mounting bolts through both brackets on both sides of the pipe, starting from the top bracket (valve side) and going into the bottom bracket. Gradually tighten the bolts, alternating side to side so that the brackets remain parallel to each other. Tighten the bolts until they are snug and you can not wiggle the saddle at all. 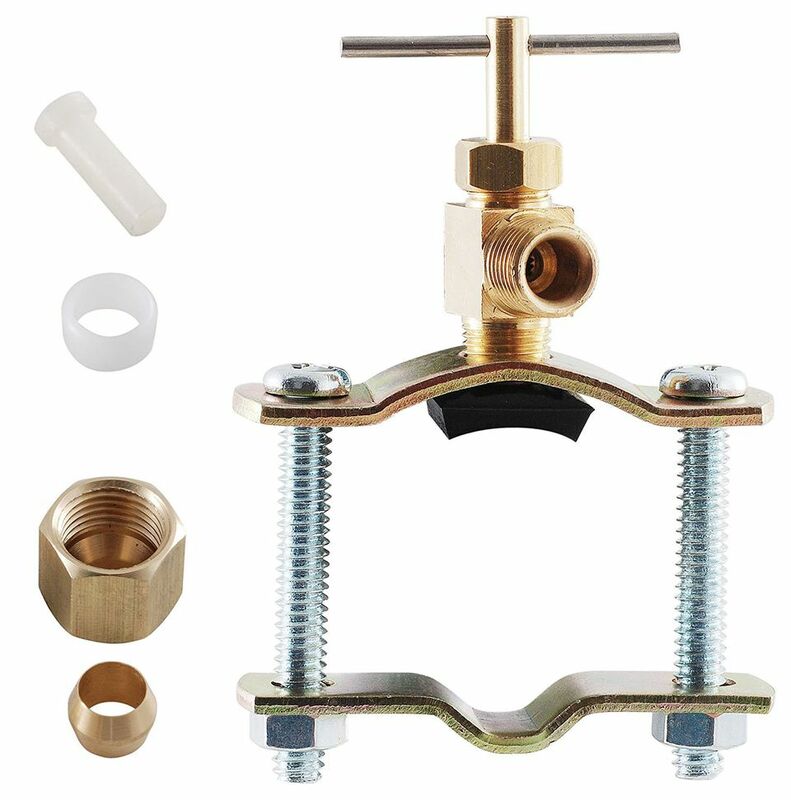 Connect the new 1/4-inch water line to the saddle valve, using the compression fitting: Slip the compression nut over the end of the tubing, then slip on the compression ring. If the tubing is plastic, insert the brass bushing provided with the saddle valve into the end of the tubing; this reinforces the tubing for a tight connection (it is not needed for copper tubing). Insert the tubing all the way into the compression fitting. Slide the compression ring up against the fitting, then thread the nut onto the fitting and tighten it with a wrench or pliers. It's a good idea to hold the valve with a second pair of pliers while you tighten the compression nut so that you do not move the saddle valve. Place the loose (unattached) end of the tubing into a sink or bucket. Turn the handle on the top of the saddle valve clockwise to drive the valve's piercing tap into the host pipe. Turn the handle until it stops, then slowly back it off (turn counterclockwise) until water flows out through the new 1/4-inch tubing. Flush the 1/4” water line for a few seconds, then close the saddle valve by screwing it back in clockwise until it stops. Connect the loose end of the new water line to the appliances or equipment it will supply, following the manufacturer's directions. Open the saddle valve by turning its handle counterclockwise several turns, as before. Check all connections for leaks, and tighten any connections that leak. With these little fittings it's not uncommon to get small leaks, so check again in an hour or so, then once the next day just to make sure everything is ok.